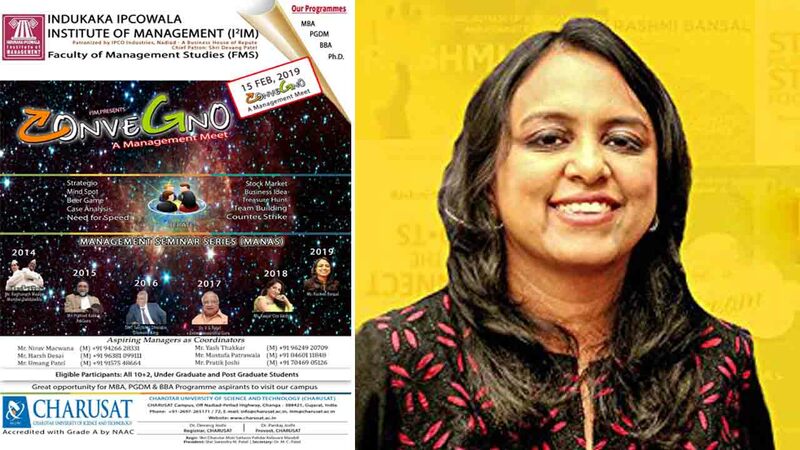 Rashmi Bansal (widely known for her books ‘Stay Hungry Stay Foolish’ and ‘Connect the Dots’) will address 500th Manas (Management Seminar Series) on the topic “Entrepreneurship and Management” at Convegno 2019 a mega carnaval at Charusat. The event will be on 15th February at Indukaka Ipcowala Institute of Management (I2IM), a constituent of Charotar University of Science and Technology (CHARUSAT), Changa. More than 1000 students of management from various institutes across the country are participating in this gala management meet. Since 2010, I2IM have been organizing CONVEGNO – Management Meet, with an objective to provide platform to aspiring managers to enable them to showcase their talents, skills and knowledge and nurture them. Eminent luminaries like Kaajal Oza Vaidya, Author & Columnist, Padma Shri. Dr. V G Patel, Entrepreneurial Guru and Founding Director, EDII, Gandhinagar, Gujarat, Savjibhai Dholakia, Diamond King of Gujarat, Surat, Prahlad Kakar, Advertising Film Director, Genesis Films, Mumbai, Raghunath Medge, President, The Nutan Mumbai Tiffin Supplier Trust, Mumbai (well known as Mumbai Dabbawalas) and Prof. (Dr.) N. Ravichandran, Director, IIM-Indore visited in earlier versions of CONVEGNO 2013 to 2018. In continuance the CONVEGNO 2019 will be held on February 15 where Rashmi Bansal will address the managment students. Rashmi Bansal is a widely known Author and Motivational Speaker and highly successful Entrepreneur. 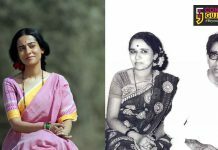 As a highly acclaimed author, she has written eight best seller books on entrepreneurship – Stay Hungry Stay Foolish, Connect the Dots, I Have a Dream, Poor Little Rich Slum, Follow Every Rainbow, Take Me Home, Arise Awake, and God’s Own Kitchen. Her first book, Stay Hungry Stay Foolish, traced the progress of 25 MBA entrepreneurs and sold over 500,000 copies, a record for books published in India. As a blogger, she writes about entrepreneurship, skills, career and youth empowerment. She is also a motivational speaker and mentor to young entrepreneurs. As an entrepreneur, she has proved her worth as a co-founder of JAM magazine which is one of India’s largest selling youth magazine. She has completed her MBA in Marketing, Advertising & Business Management from the Indian Institute of Management, Ahmedabad. “CONVEGNO aims at unleashing the emerging talent, knowledge, and skills of students of PG and UG programs. It intends to promote professional relationships among students from different institutes and emerge as a very good interface between institute and participants too. The overall objective of the meet is to enable the future business tycoons and entrepreneurs to build up professional sanctum across the country. It also aspires to help the participants assess their level of confidence and potential in several functional areas of management. Further, Manas (Management Seminar Series) on Entrepreneurship and Management will motivate young students to nurture their entrepreneur skills,” said CHARUSAT official release, while reporting about the event. This time Convegno-2019 is going to be unique in its sense as more than 15 diverse competitive events have been organized for the participants. They are Business Idea, Mind Spot, Team Building, Stock Market, Debate, Counter Strike, Case Analysis, Strategio (based on Europe’s Award Winning Game Scotland Yard), Beer Game (based on world class supply chain management), Need for Speed, Treasure Hunt, etc. Surendra Patel, President, CHARUSAT, Dr. M C Patel, Secretary, Matrusanstha, Kelavani Mandal & CHRF, Naginbhai Patel, President, Matrusanstha & CHRF, Devang Patel, Chairman, IPCO Industries, Nadiad & Chief Patron, I2IM, Dr. Pankaj Joshi, Provost, CHARUSAT, Dr. Devang Joshi, Registrar, CHARUSAT will remain present at the event.